A friend’s Sunday morning blog post has had me thinking. In Gold, Celia wrote — quite eloquently — about the power of friendship, about the twists and turns friendships take over time. In the past 24 hours, I’ve had the good fortune to live what her blog post highlights and reflect a bit, too — on the many friendships that keep me from becoming unglued, and on the life balance I swore I would find this year … and that eludes me still. Sunday night ended with the most welcome sight at the door — my dearest friend Jacquie and her son — my godson — Dominic. They needed a pit stop on the road to Dom’s college tour and I was happy to provide warm beds and breakfast to get them on their way. Jacquie and I met at Pace University and became fast friends, taking several classes together despite our divergent majors. In fact, if not for her, I’d likely have failed oceanography. I was not the early riser I am today and she often served as my alarm clock, making me promise my feet were on the floor before hanging up. Many a frantic drive across 287 for that 8:30 class, my sweatpants and makeup-free face told the true story, but she never gave up on me. 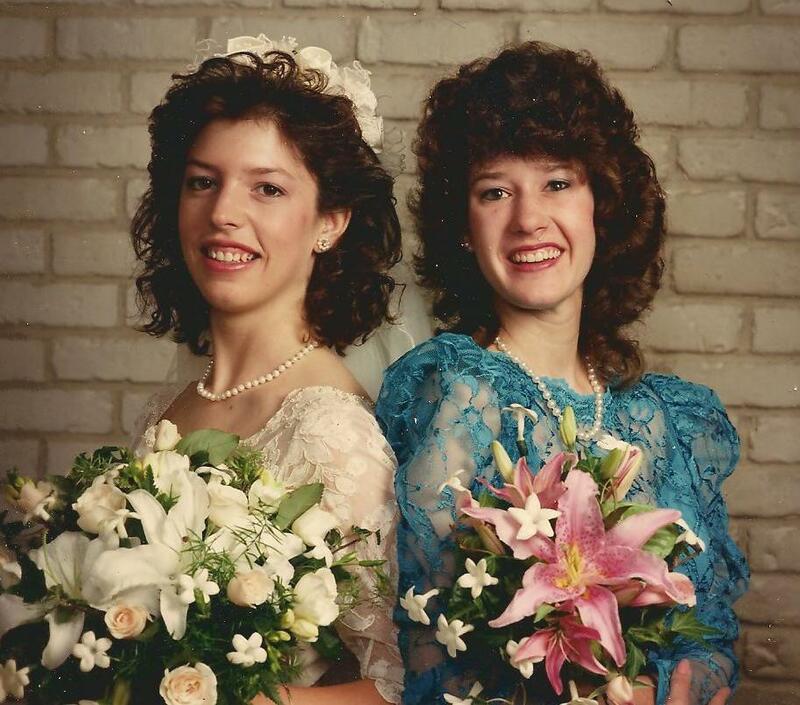 Jacquie and I the day of her wedding in 1988. We've had many adventures, before and since. And, no, we are NOT discussing my hair. Unlike some of the other folks I met at Pace, we remained in touch after graduation, going on to be in each other’s weddings, be godparents to each other’s children and serving as sounding boards, stalwart shoulders and cheerleaders for each other. She lives in Rhode Island now, not over the Tappan Zee. A a special education teacher, wife and mother of three, as well as being active in her church and other volunteer groups, she never fails to make time for me. When the kids were little, we kept the tie tight between diaper changes and feedings; these days, we catch up amid the insanity of being working moms. And when life gets in the way and too many weeks go by between calls, it doesn’t matter. We simply pick up where we left off. That was the case Sunday night. We talked until midnight, the conversation made sweeter by chocolate cupcakes (yes, I DID share them after all) and cups of tea. As she drove away this morning toward Old Dominion in Virginia, I thought of a million things I meant to ask or tell her, but I marveled too, at how lucky I am to have a friend who loves me in spite of myself. I can’t imagine my life without her, and she’s not the only one. Kathy and I go back to fourth grade, shared sleepovers and school projects, secrets and countless afternoons together. She once tried to teach me how to rollerskate; it was an epic fail, but I didn’t mind since I got to do it with her. Our relationship has changed and grown over time — and once went on hiatus thanks to a thoughtless comment I made, but we patched things up and continue to support each other through life’s unexpected twists and turns. She lives in Virginia now, and is always in my thoughts even when I don’t manage to make it to the phone. Kristen and I are fairly new friends — our thinking so similar that I sometimes wonder if we weren’t separated at birth. She is an inspiration to me every day — and getting her to laugh out loud is a very satisfying feat. Pina is a newer friend, too. Her positive attitude never fails to cut through my cynicism. Like my other friends, she is beautiful, inside and out. The relationship I share with Denise has reached a new level of late. The rocky start is all my fault — prickly at first and very defensive, I didn’t leave myself open to really getting to know her. As I relax in mid-life, I find time and again that I’ve missed out on a great deal; we are more alike that I knew. Andrea and I met at The Rivertowns Enterprise where I was reporter and then editor in the late ’80s and ’90s. We’ve fallen into being Christmas card friends, but I grabbed a chance to have lunch with her yesterday and I’m so glad I did. We were able to catch up and laugh like we used to back when we were sharing the chaos of a small newspaper operation and enjoying the amazing cakes she baked (I especially remember a caramel cheesecake that tasted heavenly, as long as you had a chain saw to cut through the caramel crust!). I left the restaurant kicking myself — why didn’t I tend this and my other relationships as well as I should have? — and pledging to reorder my priorities. Right now. Love the fact that you open your door whenever I knock. Wish we could have stolen Catherine from school and taken her with us on our trip. Looking forward to our “spa day” (only a year later than we planned). This is a really nice post! And for the record, I think your hair looks lovely in the photo! It’s nice long, and it’s nice short! Thanks, Bern! And of course, you rank among my nearest and dearest as well — forever bound by our many experiences in Journalism Center!